In 2004, Dave and Barbara, two almost-retired teachers, set out to fulfill a dream. 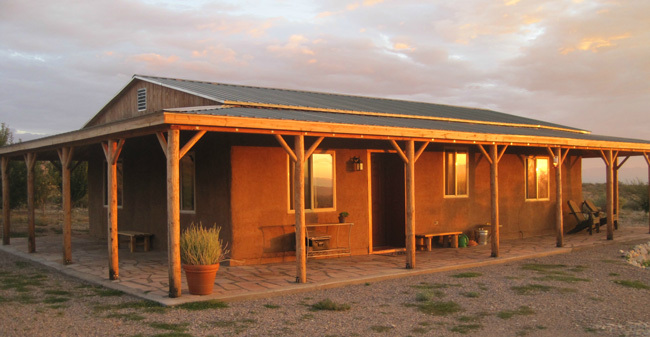 They had purchased land in southeastern Arizona in the Dragoon mountains, eventually building an adobe guesthouse and a strawbale main house on it. 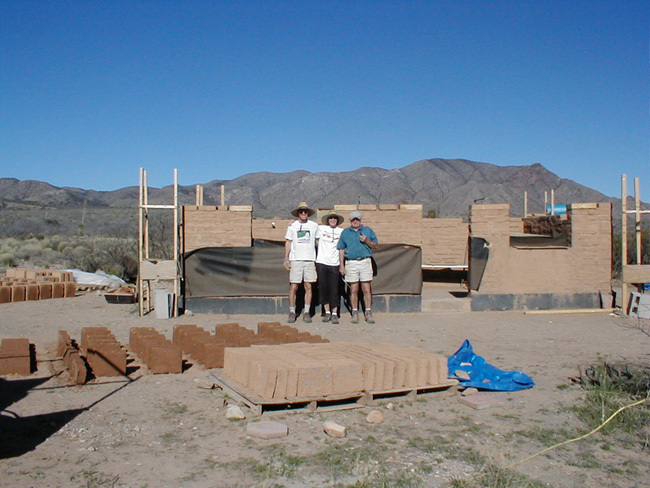 Construction began first on their 320 square foot adobe guesthouse while they were still teaching in Tucson, 75 miles away. All told, they cast about 2500 40-pound adobes, or about 100 each weekend. Neighbors were in on the fun as well, not only contributing to the actual building, but doing things like turning the heat on or leaving cookies for when they arrived Friday evenings from teaching all week. 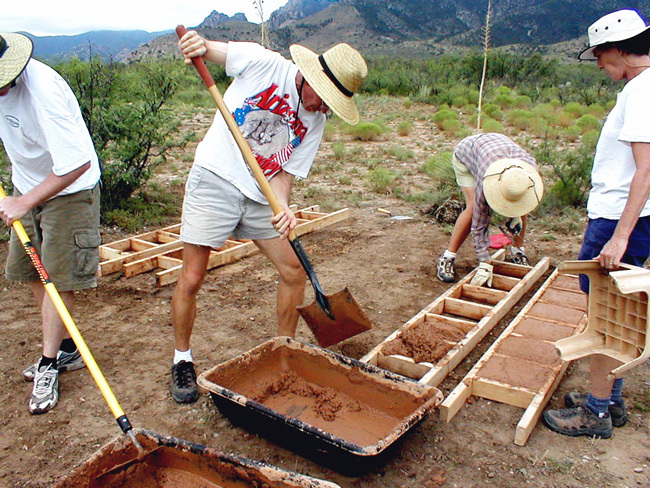 Waking up Saturday, they would create their adobe mix and pour it into molds. 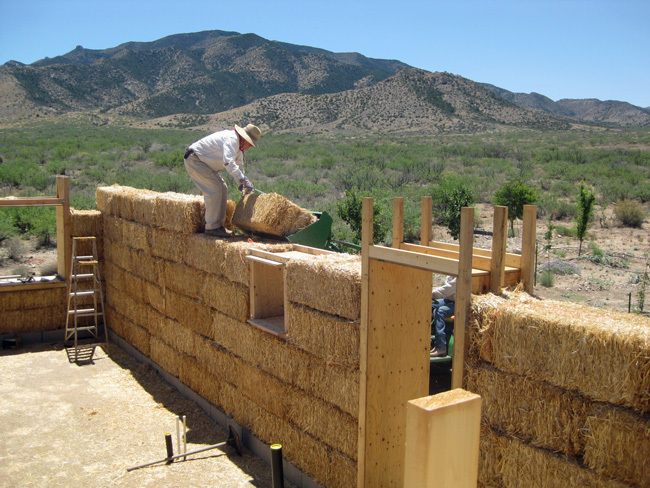 Sundays they’d build the guesthouse walls with adobes made the previous weekend. Dave says his neighbors may be “trying for sainthood,” as he and Barbara were also invited over for a hot meal every Saturday evening. 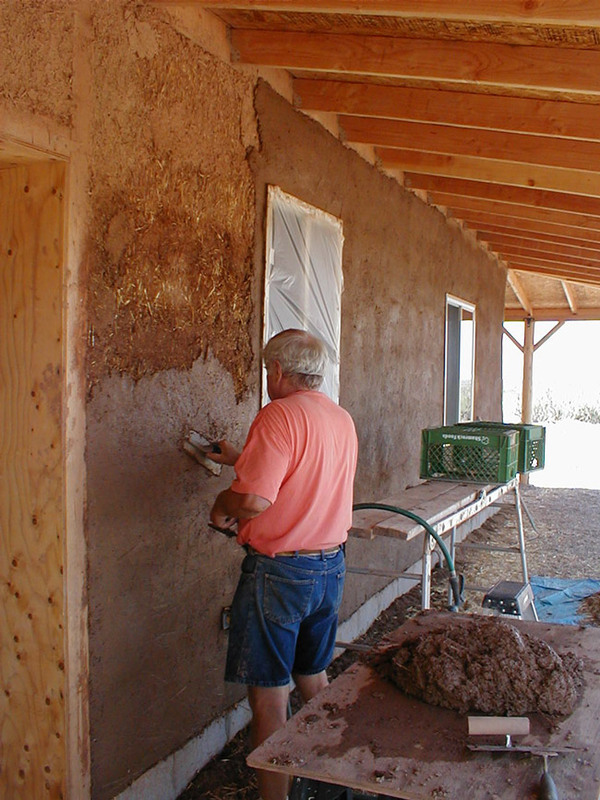 The adobe cottage going up, with week-old adobes and newly cast ones. Dave, who taught English, reads mindfulness authors such as Emerson, Thoreau, and Thich Nhat Hanh, but things weren’t always this peaceful. He spent his career following his passion and owned a series of private schools working with at-risk kids, saying "I started schools in Washington DC, Salt Lake City, Denver, Minnesota, Dakota, Arizona, I spent all of my time in the airport. It was a terrible life for me, I didn’t like it. I made rather a lot of money and spent most of it, almost all of it." Dave takes in the view as the adobe cottage takes shape. The dream of a quiet escape where he could read and take long hikes had been a dream of his for quite some time. He’d built his first cabin in southern Oregon back in ‘67, a project he eventually sold due to a lack of employment in the area. Today, he says, things have changed for rural living, noting the myriad of employment opportunities that have sprung up with the internet. 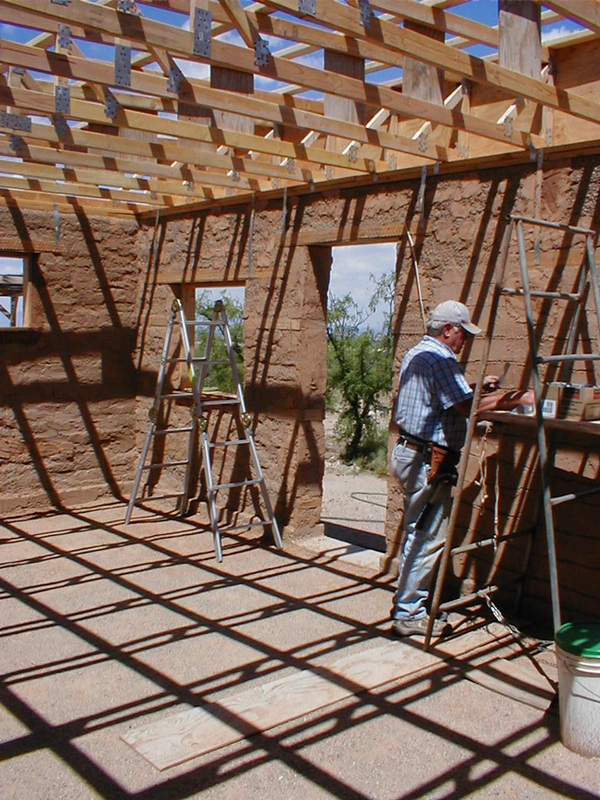 Dave under the newly-installed roof trusses of the adobe cottage. When I asked what drove him to take action on that first project, he said “being willing to take a risk. I think that’s the single biggest thing that holds people back, they’re afraid. There are so many people that are afraid of what other people would think if they fail at what they’re doing and that comes to the core of it, in my opinion." 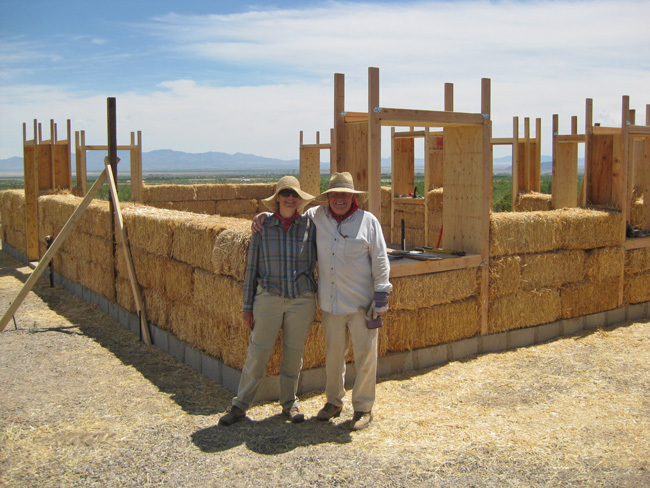 Dave and Barbara, with the 720 square foot strawbale main house taking shape. Dave loads bales on the strawbale house, with a little help from a big green tractor. They quickly learned each other's strengths. Barbara, the math teacher, was adept at drawing plans and was also skilled at mixing the earth plaster with the proper ratio of ingredients. She also made sure the buildings were squared up correctly. 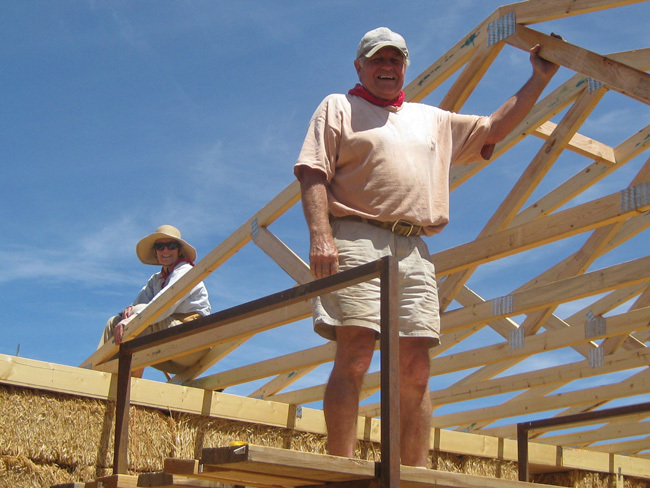 Dave and Barbara, putting on the trusses of the strawbale house. 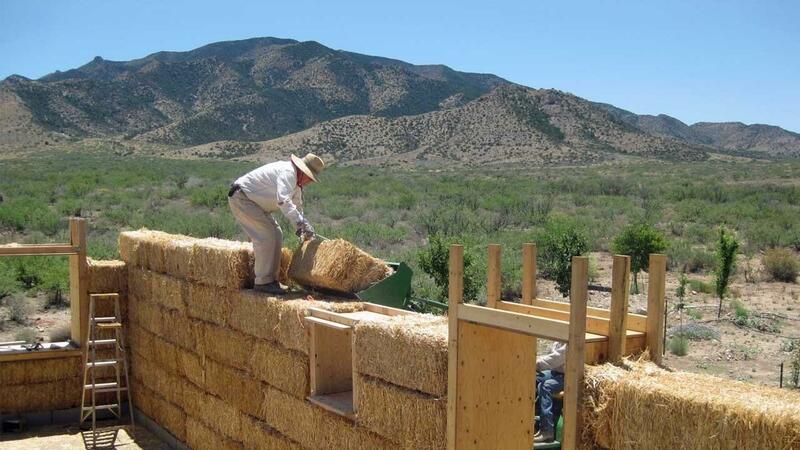 The bale walls were built, trusses added, and metal roof constructed in 14 days, with help from a neighbor. The key for Dave and Barbara was having their components pre-built and ready to go. 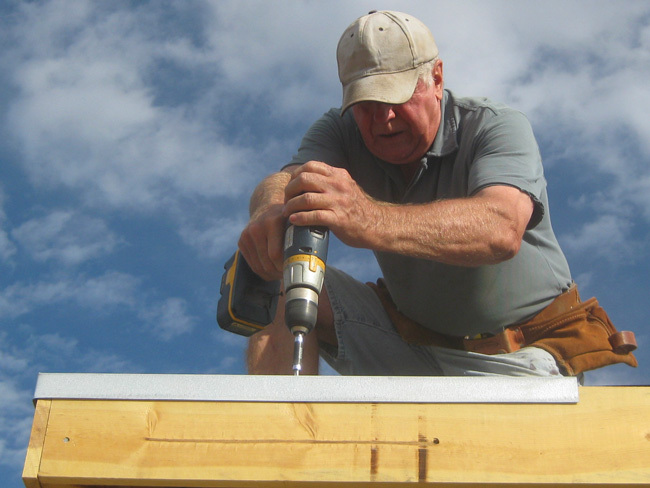 Dave installs a drip edge for the metal roof of the main house. 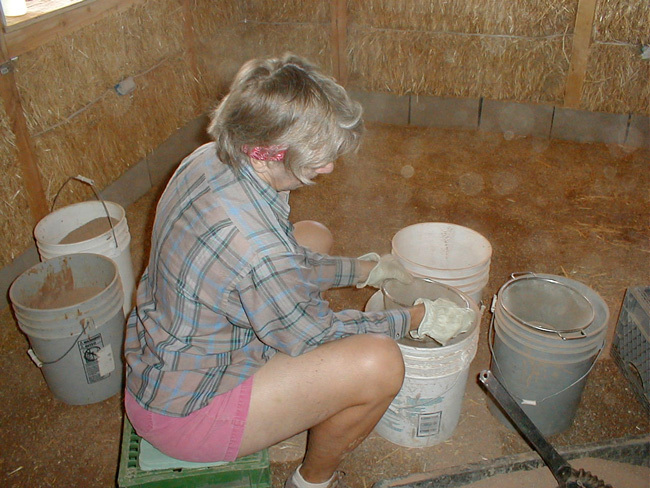 Dave applies the earth plaster while Barbara does the mixing. The finished strawbale house at sunset. Dave and Barbara live in southeastern Arizona on 10 acres in the Dragoon Mountains. Dave runs Simple-Living-Today.com, sharing their journey of simple living, gardening, and DIY home building. He also offers whatever advice he can to aspiring DIY homebuilders, working with people as far away as New Zealand. Dave and Barbara also enjoy hosting visitors from around the world at the Dragoon Mountains Adobe Guesthouse, their B&B. Check it out at Simple Living Today: A New American Dream. Dave and Barbara's story shows what can happen when we build up our courage over time. Although he ended up moving away, that first cabin Dave built at 25 years old undoubtedly led to some of the bigger risks in his life, such as creating schools for at-risk kids and building the homestead in Arizona. If you found Dave and Barbara's story inspirational, please share it using the buttons below. We can break out of the box. Sometimes we just need a good example of someone who did.